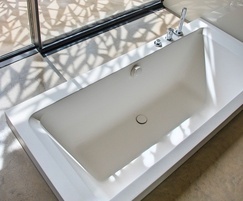 The Serenity 1800 double ended bath by Cabuchon. The Serenity 1800 double-ended bath from British manufacturer Cabuchon Bathforms featured recently in an award-winning house design in Oxfordshire. Designed by architects Sarah Griffiths and Amin Taha, ‘The Pheasants’ won two prestigious awards in 2018. Both were issued by the Royal Institute of British Architects: the RIBA South Award 2018 and RIBA Project Architect of the Year. The property’s distinctive modern design also gained it a finalist’s place in the 2018 Grand Designs RIBA House of the Year competition. The Pheasants made it through to a shortlist of just eight, with the results announced on Channel 4 at the end of November. For its part, Cabuchon Bathforms was delighted to supply its hand-made Serenity 1800 built-in bath for the project. 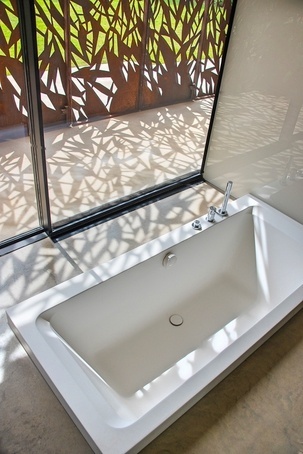 The company supplied the bath with a specially requested matt finish and a bespoke rim. This was made with an extended downturn on three sides, giving it more presence in its semi-sunken position by the window. Writing to Cabuchon after the installation, Mr Fletcher described the bathing experience very simply: “a joy”. The Serenity built-in bath is made in Cabuchon's own proprietary material, Ficore®, and is available in a choice of four sizes. A larger version - the Serenity Plus - is also available.